National Leader of the All Progressives Congress (APC) Asiwaju Bola Tinubu, has slammed controversial businessman and People’s Democratic Party (PDP) senator-elect, Prince Buruji Kashamu, saying he does not need praises from Kashamu as they are not in the same class. Kashamu had in an advert lauded Tinubu over the outcome of the 2015 general elections to the chagrin of the former governor of Lagos State. He had also called Tinubu a role model. Tinubu therefore advised Kashamu to make a trip to the United States of America to answer drug charges against him before talking to or about him. “Please keep your peace until you make your trip to the USA as a Senator-elect. Upon your return we can then have a conversation. We can then proceed with your repudiation of the PDP with a promise that you will stop corrupting and fouling the political system,” Tinubu said in a statement signed by his media adviser, Sunday Dare. “Our attention has been drawn to the recently advertised letter by Mr. Buruji Kashamu to Asiwaju Bola Tinubu in which he described Tinubu in superlative terms and as his role model. Kashamu needs to stop this cynical fawning. It will not work. “The days of false adulation are gone in Nigerian politics. Fake praise singers like Kashamu will find that their particular craft is no longer in vogue. During this election cycle, their practice has dramatically turned from the way things are to how it used to be. “Henceforth, there will be consequences for the positions a politician takes and the words they utter. “Politicians will no longer be able to change direction and loyalties as if they were changing clothes. Those in politics must know that responsibility and accountability shall now follow them. One can no longer walk both sides of the street at the same time. In case Kashamu has not noticed, the politics of principle defeated the politics of posturing. “That Kashumu undermined the democratic process by buying his victory does not mean he is part of the new Nigeria. He is merely an isolated vestige of a dying past. The man is an extinct species the realization of which will soon dawn on him. “For him to liken himself to Bola Tinubu is for a small rut to call itself a mountain. For Kashamu to call Tinubu a role model is Kashamu’s admission that he does not know the meaning of the term. There are no grounds for comparison. There is only contrast. Tinubu has sacrificed years trying to bring democracy to Nigeria. He struggled in opposition to the powers that be. Without this, at times, lonesome fight and singular determination, the great change in Nigerian politics would not have happened as it did. TInubu is an architect of democracy. Kashamu is a failed demolisher of that which Tinubu has strived to build. Under Kashamu’s designs, our elections would be a wholly mercantile undertaking. “Meanwhile, Kashamu has blown wherever the prevailing winds took him. He stood for nothing and sacrificed nothing except the people’s welfare. “This same Kashamu rained insults on former President Obasanjo in a vicious campaign of calumny. Kashamu’s party, PDP sponsored defamatory documentaries full of lies and innuendos against me, General Muhammadu Buhari and other leaders of APC. Please keep your peace until you make your trip to the USA as a Senator-elect. Upon your return we can then have a conversation. We can then proceed with your repudiation of the PDP with a promise that you will stop corrupting and fouling the political system. “Kashamu in a factory of incoherent mischief aimed at achieving selfish goals. Before the election, Tinubu was his arch-enemy. Now he seeks to be the prodigal son returned home. This scam will fail. 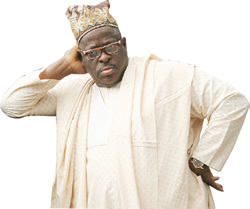 “Kashamu may be prodigal but he is no political son of Tinubu. Kashamu’s political lineage tracks to people like Bode George and President Jonathan. He should direct his encomiums to these men who are his true role models. They need his contrived affections more than Tinubu does,” the statement added. Role model or not, who is the better of the two men, see kettle calling cooking pot black.